Lamborghini has never shied away from challenges, which is precisely why it created the new Aventador SVJ Coupé – The pinnacle of Lamborghini V12 super sports cars. 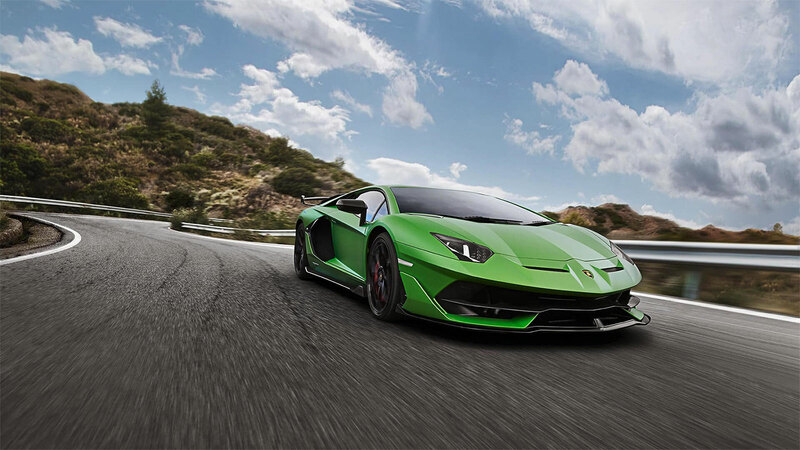 Sant’Agata Bolognese/Monterey (CA), 23 August 2018 – Automobili Lamborghini unveils the Lamborghini Aventador SVJ in a worldwide premiere during Monterey Car Week in California at “The Quail, A Motorsports Gathering”. The distillation of extraordinary design, groundbreaking technologies and the ultimate in handling, performance and driver enjoyment, the Aventador SVJ creates pure driving perfection, taking the concept of a super sports car to a new dimension. – meaning ‘superfast’ – takes the ‘Jota’ suffix, denoting its track and performance superiority: the Aventador SVJ has already claimed its position as the Nürburgring-Nordschleife production car record holder, completing the 20.6 km lap in just 6:44.97 minutes. Production is limited to 900 units. A special edition, named SVJ 63, is exclusively unveiled on the concept lawn at the Pebble Beach Concours d’Elegance. It pays homage to Lamborghini’s founding year of 1963: produced in a unique configuration, it demonstrates the rich use of carbon fiber and is made in an additional limited number of just 63. The Aventador SVJ’s Nürburgring-Nordschleife lap record is living proof of its benchmarking performance. With its optimized power plant making it the most powerful series production V12-engined car produced to date by Lamborghini, the SVJ features an increase in power to 770 hp (566 kW) at maximum 8,500 rpm. The SVJ outputs 720 Nm of torque at 6,750 rpm, while a dry weight of just 1,525 kg gives the SVJ a weight-to-power ratio of 1.98 kg/hp. The SVJ accelerates from standing to 100 km/h in 2.8 seconds and from 0 to 200 km/h in 8.6 seconds. A top speed of more than 350 km/h is complemented by a braking distance of 100 km/h to 0 in 30 meters. The Aventador SVJ is, however, more than a super sports car achieving the top numbers. The development philosophy of the Aventador SVJ and its very essence in terms of design, aerodynamic technologies and efficiency, weight-to-power as well as performance, is to create a demanding driver’s perfect car. Every feature of the Aventador SVJ resonates its aerodynamic prowess: the SVJ is significantly enhanced in appearance compared to the Aventador S, with every facet of its ‘form follows function’ design a reminder of its raison d’être on road and track: innovate to be the best. The main goal in design was a significant downforce improvement compared to the previous Aventador SV: +40% on both axles with an improved drag coefficient -1%. From the front the car is wider: a new front bumper with integrated side fins features a new air intake and highlights the inclusion of Aerodinamica Lamborghini Attiva (ALA), Lamborghini’s patented active aerodynamics technologies. The disconnected front splitter continues the impression of a floating component, while providing a channel for airflow. A tri-dimensional air outlet on the hood directs airflow, improves both drag and downforce, and clearly alludes to the aerodynamic purpose of the SVJ’s design. The upper body aerodynamic optimization has contributed 70% to the total downforce improvement in the SVJ over the SV. The SVJ’s rocker is entirely new, adopting the ‘Y’ theme found in Lamborghini cars while also resembling shapes found in jet fighters. The bigger side air intakes and the new front side fins reduce drag and improve overall cooling. An improved underbody aero design with vortex generators works in conjunction with front diffusers and a new, extreme-design rear diffuser, together with divergent fins, contributes 30% to the total downforce improvement. The rear wing of the SVJ has been designed for best aerodynamic efficiency, based on a new air foil; an optimized ALA 2.0 system; and side winglets to reduce turbulence while providing high downforce on the straight as well as in high speed corners. At the rear of the car the position of the high-mounted naked exhaust resembles those found on extreme motorbikes, as well as saving weight due to its proximity to the engine: the exhaust system itself is also lighter. The Omega-shape rear bumper incorporates a massive new diffuser that contributes to downforce, while a new high-mounted rear wing is produced entirely in carbon fiber with its integrated ALA system. The new rear engine bonnet has been redesigned for the SVJ: it is made from lightweight carbon fiber and removable via quick release clips in a reference to motor racing. It also adopts the ‘Y’ theme that reveals the updated V12 power plant below, while accenting the car’s high performance characteristics. Super-light ‘Nireo’ aluminum rims are designed specifically for the SVJ, saving weight and contributing to the extreme dynamism of the car. Optional ‘Leirion’ aluminum rims with ‘Y’ and hexagonal details are also available. The Italian flag detail on the side wing is a reminder of the Lamborghini’s Italian super sports car heritage. Lamborghini’s patented ALA system was first seen on the Huracán Performante, and has been developed to an enhanced level for the Aventador SVJ, now ALA 2.0, including new optimized air inlets and aero channel designs. The system has been re-calibrated taking into account the enhanced vehicle’s lateral accelerations. Utilizing Lamborghini Dinamica Veicolo Attiva 2.0 (LDVA 2.0) with improved inertial sensors that govern all the car’s electronic systems in real time, the ALA system flaps are activated in less than 500 milliseconds to ensure the best aerodynamic set-up of the car in every driving condition. When ALA is off, the active flaps are closed, generating the desired high downforce for high speed cornering and full brake conditions. When ALA switches to ‘on’ the front flaps are opened, reducing air pressure on the front spoiler and directing air flow via an inner channel and through the specially-shaped vortex generators on the underside of the car. This drastically reduces drag and optimizes conditions for maximum acceleration and top speed. When ALA is off the rear flaps are also closed, allowing the rear wing to act as a traditional fixed wing. Stability is enhanced in high speed cornering and full braking by creating maximum vertical downforce. When ALA is ‘on’ the flaps on the engine bonnet open in order to stall the wing for improved drag in high speed conditions. In addition, the rear wing’s inner air channel is split right and left, allowing aero vectoring for high speed cornering. Depending on the direction of the turn, the LDVA 2.0 instructs ALA to be switched on in either the right or left side of the wing, increasing downforce and traction on the inner wheel and counteracting the load transfer in rolling conditions. This in turn optimizes the chassis’ momentum, requiring a reduced steering angle and improving the car’s overall dynamic stability. The aero vectoring technology in the SVJ has been further developed to improve the aero-loading effects on the inner wheel by 30% compared to the original system. The enhanced powertrain features a new titanium intake valve with a new-shape intake runner and length, with a modified intake cylinder head duct for higher flow coefficient. The new, lightweight exhaust system reduces backpressure as well as producing the most emotive sound, and the optimized seven-speed Independent Shifting Road (ISR) gearbox has been calibrated for the car’s increased performance in terms of both power and torque. The Aventador SVJ’s vertical, lateral and longitudinal dynamics have been re-engineered in LDVA 2.0, with algorithms fully integrated within ALA 2.0 to reflect the exceptional downforce generated and optimize performance: the result of significant R&D investment and collaboration with the CFD team. The SVJ’s suspension has been reworked, providing higher mechanical and aerodynamic grip. Anti-roll bar stiffness has been improved by 50% compared to the Aventador SV, compensating against roll and improving aero efficiency. A higher damping force range, increased by 15% over the SV, and Lamborghini’s Magneto Rheological Suspension (LMS) has been recalibrated to improve body and wheel control with a focus on track performance. The Aventador SVJ’s rear-wheel steering (LRS) is further engineered to exploit the aero load in every environment, providing exceptional stability in high speed conditions and improving agility in cornering to enhance average speed in all dynamic conditions. The Aventador SVJ’s steering has also been developed to provide the feedback demanded in high-performance track and racing environments. The rebalanced power steering reflects the specific aero load and tires, and the Lamborghini Dynamic Steering (LDS) is recalibrated to further improve steering precision and natural feedback. The Lamborghini SVJ’s four-wheel drive system has improved torque split to maximize traction and agility, with the higher stability of the SVJ allowing a further 3% of torque to be sent to the rear axle compared to the SV. The rear-wheel steering has been developed to further improve the car’s stability while reducing braking distances, particularly in combined braking/turning conditions such as high speed cornering. ESC has been enhanced for improved cornering and driver experience in extreme handling conditions, and ABS has been specifically tuned for the improved grip provided by the tires and ALA system. New Pirelli P Zero Corsa tires have been specifically developed, according to Lamborghini’s brief for the SVJ: the tires provide higher vertical stiffness to accommodate the SVJ’s higher downforce, as well as provide a high grip level to enhance overall vehicle performance. Featuring a specific tread design, the tires are designed to optimize performance on both road and track. Optional street-legal Pirelli P Zero Trofeo R tires can be mounted specifically for track use. The Aventador SVJ is a driver-focused car, developed to maximize the union between driver and car in the most extreme road and track conditions and ensure the most rewarding experience. With Lamborghini’s three driving modes, Strada, Sport and Corsa, as well as the EGO option allowing the driver to further customize his preferences for car set-up, the cockpit features Kombi graphics on the TFT digital dashboard display as well as showing live status of the ALA functions. The Navigation System and Infotainment System including AppleCarPlay come as an option free of charge, allowing the cockpit’s occupants to manage voice activated communications and entertainment from personal Apple devices. The Lamborghini telemetry system is an optional specification: recording lap times and track performance as well as trip data, the telemetry system is especially appealing to the owner who wants to take his car on track. The interior specification of the Aventador SVJ is virtually limitless through Lamborghini’s Ad Personam customization program.